I have found numerous hobby records about favorite pastimes, but this ditty from Trinidad, on the joys of bowling, is a first. 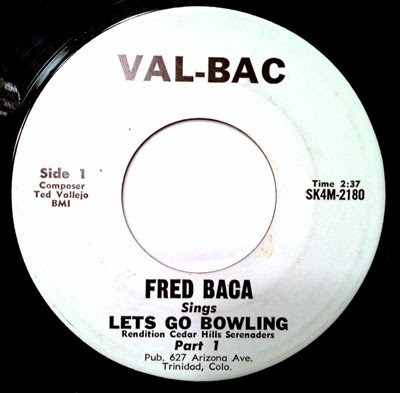 Listen to a sample of "Let's Go Bowling"
Once again, this one is a mystery. 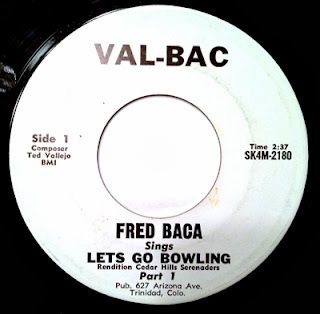 One can assume that the label Val-Bac is the amalgamated name for the song's composer, Ted Vallejo and the singer, Fred Baca. Based on the label number (SK4M-2180), I thought it might be a Rite pressing from the mid to late 1960s. However there is also an RCA Pressing "H" of note. Address for the label is 627 Arizona Avenue, which a quick Google map search shows as an apartment complex, hugging the interstate. "Hi. I just wanted you to know that Fred C. Baca, of Trinidad, CO, who sings on this recording did not pass away. He still lives in the Trinidad area and occasionally still plays his fiddle and his Rickenbacker guitar. Fred and The Serenaders regularly perform on weekends at the El Rancho Club in Trinidad for close to two decades. They were a very popular band - one that continued to perform for weddings, reunions, and other special weekend events well into the late 90s. How do I know all of this? Because Fred is my father. I am so grateful for the recording you provided - only a couple of the original physical copies survived within our family - they were seemingly lost. Thank you for this post!!!" Ted Vallejo passed away in 1988.